Valletta 2018 Foundation Chairman Jason Micallef was today present at a press conference held earlier today at Fort St Elmo, in which the final details for Notte Bianca 2016 were announced. Notte Bianca is fast upon us. Before the big night of festivities this Saturday the 1st of October, the Notte Bianca team held a final press conference on Wednesday the 28th at St Elmo Chapel. The press conference addressed the final planning, logistics and social media aspects of the event. During Notte Bianca, Malta Public Transport will be organising a special extended bus service. There will also be a shuttle service around Valletta between 5pm and midnight. Holders of a tallinja card may pay the special night fare of €2.50. Non-card holders may pay €3.00 on the bus. For more information, customers may contact Malta Public Transport on 2122 2000. Ferries will operate a shuttle service from Sliema to Marsamxett, Valletta, and from the Three Cities to Lascaris, Valletta and back. This shuttle ferry service will continue till 2am of Sunday 2nd October. Gozitans may also rest assured as the Gozo Channel will be running according to the more frequent summer schedule. Furthermore, taxi services will be available from the Floriana Bus Terminus. Park & Ride Blata l-Bajda as well as the Floriana and Valletta car parks will also be operating on the night. Those intending to enjoy all that Notte Bianca has to offer may wish to download the Notte Bianca app, via www.nottebianca.org.mt or directly from Play Store, Google Play and iTunes. The app includes information about all the events taking place on the 1st October, including event synopses, times and locations, as well as an interactive map locating all event venues. The app is compatible with tablets, iPads, iPhones and Android mobile phones. 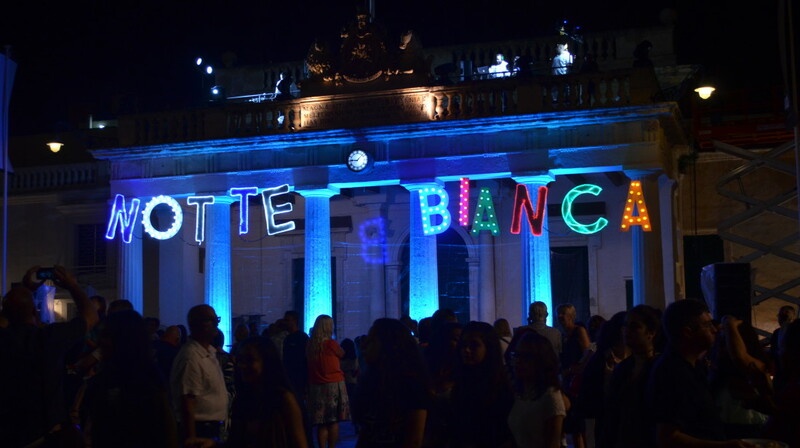 Visitors may also wish to share their Notte Bianca experience on social media by posting their photos and reactions to the official Notte Bianca Facebook page – www.facebook.com/nbvalletta – or to Twitter using the hashtag #NotteBianca. Please visit www.nottebianca.org.mt for more information.